Edmund I (Old English: Ēadmund, pronounced [æːɑdmund]; 921 – 26 May 946) was King of the English from 939 until his death. His epithets include the Elder, the Deed-doer, the Just, and the Magnificent. Edmund was the son of Edward the Elder and his third wife Eadgifu of Kent, and a grandson of Alfred the Great. His father died when he was young, and was succeeded by his oldest son Æthelstan. Edmund came to the throne upon the death of his half-brother in 939, apparently with little opposition. His reign was marked by almost constant warfare, including conquests or reconquests of the Midlands, Northumbria, and Strathclyde (the last of which was ceded to Malcolm I of Scotland). Edmund was assassinated after six-and-a-half years as king, while attending Mass in Pucklechurch, Gloucestershire. He was initially succeeded by his brother Eadred, but his two sons – Eadwig and Edgar the Peaceful – both later came to the throne. 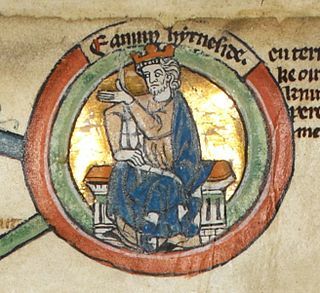 Edmund came to the throne as the son of Edward the Elder, and therefore the grandson of Alfred the Great, great-grandson of Æthelwulf of Wessex and great-great grandson of Egbert of Wessex, who was the first of the house of Wessex to start dominating the Anglo Saxon realms. However, being born when his father was already a middle aged man, Edmund lost his father when he was a toddler, in 924, which saw his 30 year old half brother Athelstan come to the throne. Edmund would grow up in the reign of Athelstan, even participating in the Battle of Brunanburh in his adolescence in 937. 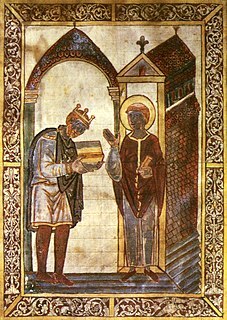 Athelstan died in the year 939, which saw young Edmund come to the throne. Shortly after his proclamation as king, he had to face several military threats. King Olaf III Guthfrithson conquered Northumbria and invaded the Midlands; when Olaf died in 942, Edmund reconquered the Midlands. In 943, Edmund became the godfather of King Olaf of York. In 944, Edmund was successful in reconquering Northumbria. In the same year, his ally Olaf of York lost his throne and left for Dublin in Ireland. Olaf became the king of Dublin as Amlaíb Cuarán and continued to be allied to his godfather. In 945, Edmund conquered Strathclyde but ceded the territory to King Malcolm I of Scotland in exchange for a treaty of mutual military support. Edmund thus established a policy of safe borders and peaceful relationships with Scotland. During his reign, the revival of monasteries in England began. Edmund, king of the English, sent messengers to Duke Hugh about the restoration of King Louis, and the duke accordingly made a public agreement with his nephews and other leading men of his kingdom. [...] Hugh, duke of the Franks, allying himself with Hugh the Black, son of Richard, and the other leading men of the kingdom, restored to the kingdom King Louis. On 26 May 946, Edmund was murdered by Leofa, an exiled thief, while attending St Augustine's Day Mass in Pucklechurch (South Gloucestershire). John of Worcester and William of Malmesbury add some lively detail by suggesting that Edmund had been feasting with his nobles, when he spotted Leofa in the crowd. He attacked the intruder in person, but in the event, Leofa killed him. Leofa was killed on the spot by those present. A recent article re-examines Edmund's death and dismisses the later chronicle accounts as fiction. It suggests the king was the victim of a political assassination. 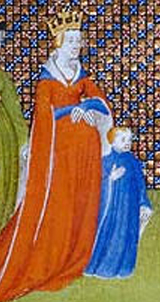 Edmund's sister Eadgyth, the wife of Otto I, Holy Roman Emperor, died earlier the same year, as Flodoard's Annales for 946 report. Eadwig, King of England from 955 until 957, king of only Wessex and Kent from 957 until his death on 1 October 959. Edgar the Peaceful, king of Mercia and Northumbria from 957 until his brother's death in 959, then king of England from 959 until 975. ^ "Edmund I | king of England". Encyclopedia Britannica. Retrieved 2018-06-17. ^ a b David Nash Ford, Edmund the Magnificent, King of the English (AD 921-946), Early British Kingdoms. ^ Richerus, Historiae, Book 2, chapters 49–50. See MGH online[permanent dead link]. ^ Dorothy Whitelock (tr. ), English Historical Documents c. 500–1042. 2nd ed. London, 1979. p. 345. ^ "Here King Edmund died on St Augustine’s Day [26 May]. It was widely known how he ended his days, that Liofa stabbed him at Pucklechurch. And Æthelflæd of Damerham, daughter of Ealdorman Ælfgar, was then his queen." Anglo-Saxon Chronicle, MS D, tr. Michael Swanton. ^ K. Halloran, A Murder at Pucklechurch: The Death of King Edmund, 26 May 946. Midland History, Volume 40, Issue 1 (Spring 2015), pp. 120-129. ^ Edmundus rex Transmarinus defungitur, uxor quoque regis Othonis, soror ipsius Edmundi, decessit. "Edmund, king across the sea, died, and the wife of King Otto, sister of the same Edmund, died also." (tr. Dorothy Whitelock, English Historical Documents c. 500–1042. 2nd ed. London, 1979. p. 345). Dumville, David (1985). "Learning and the Church in the England of King Edmund I, 939-946". The Historia Brittonum 3, The Vatican Recension. Cambridge, UK: Brewer. Wikimedia Commons has media related to Edmund I of England. 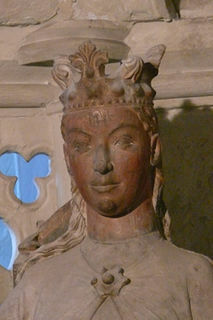 Edith of England, also spelt Eadgyth or Ædgyth, a member of the House of Wessex, was German queen from 936, by her marriage with King Otto I.
Wessex was an Anglo-Saxon kingdom in the south of Great Britain, from 519 until England was unified by Æthelstan in the early 10th century. 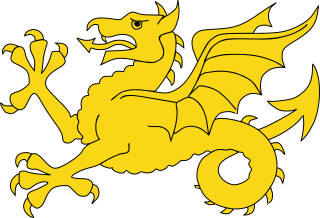 Eadgifu or Edgifu, also known as Edgiva or Ogive was a daughter of Edward the Elder, King of Wessex and England, and his second wife Ælfflæd. She was born in Wessex. From the destruction of the Anglo-Saxon Kingdom of Northumbria by the Vikings in 867 to the early eleventh century, Bamburgh and the surrounding region, the northern part of Northumbria, was ruled for a short period by shadowy kings, then by a series of ealdormen and high-reeves. Several of these men ruled all Northumbria.